I just recently got the Kukpo garlic press and I love this thing! Now I need to preface this with the fact that my family is Italian and we use garlic in everything! I mean everything! This press is one of the best I have every used. It is really high quality steel, its super sturdy and work amazingly on pressing the garlic. You can use it like any typical garlic press. Place the garlic in the press and press firmly. The peel stays inside the press housing and the minced garlic will come out. So easy!!! I was amazed by this. This is great for me because sometimes I want minced garlic but sometimes I want it chopped. Couldn’t be any easier! UNMATCHED HIGH QUALITY – The premium quality garlic peeler and crusher is made of Grade A FDA approved sturdy 18/10 stainless steel. The strength of the metal will ensure that this kitchen appliance lasts for generations to come. It is also anti-corrosive, robust and prone to wear and tear. USER-FRIENDLY FUNCTIONALITY – There will be no more odours of garlic remaining in your hands. With this advanced stainless steel garlic crusher, all you have to do is place several garlic cloves in the chamber and press using the handles. Now you have perfectly minced garlic ready to go right into your dishes. Simply extract the skin before adding the finely minced garlic. The same way you can rush the ginger you need for your cuisine. 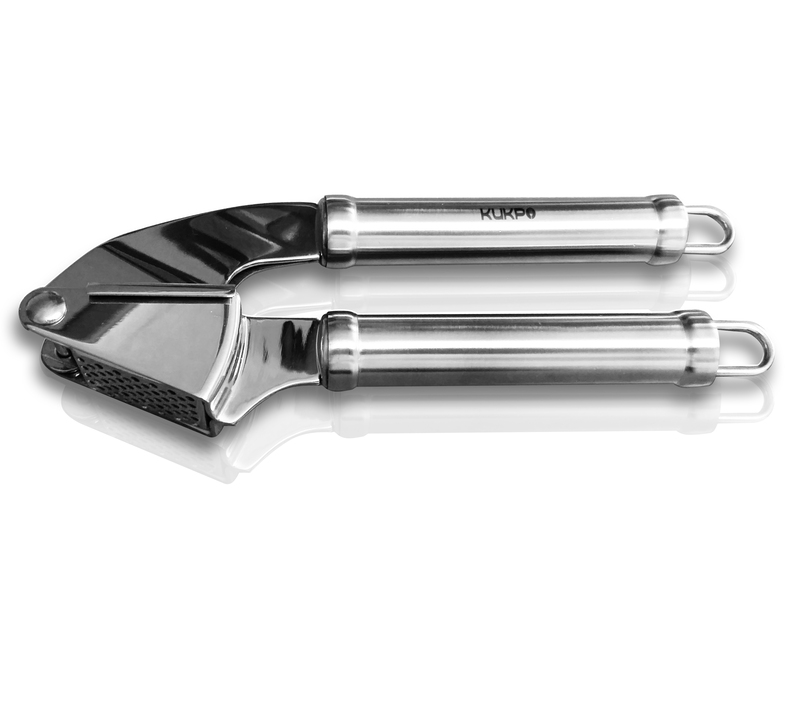 DESIGNED FOR PROFESSIONALS – If you purchase this versatile garlic crusher, you are lucky to set your hands on a professional grade kitchen utensil used by all the chefs of star class hotels and restaurants, restaurant franchises and even by the food trucks that have the most amazing dishes lined up. COOK HEALTHY CUISINES WITH EASE – Garlic is a spice that has multiple health benefits apart from acting as an essence that enhances the taste of food. Bake delicacies like garlic bread, mouth-watering Italian and Mexican cuisine without the hassle of peeling and chopping the garlic cloves at your home. DISHWASHER SAFE – We understand that you have a limited amount of time to engage in boring chores like washing. Thus, the cleaning process of this high quality garlic clove peeler has been made extremely easy. You can simply place it in the dishwasher and sit back while it gets completely cleaned.